Robert Andrew Parker attended the school of the Art Institute of Chicago from 1948 until 1952 and worked during the following months at the Skowhegan School of Painting and Sculpture in Maine and at Stanley William Hayter's Atelier 17 in New York. Since his first solo show in 1954, Parker has exhibited extensively, and his credits include set designs for opera and film as well as book illustrations. This folktale told using ancient Chinese puzzles and watercolor illustrations has been beloved for over twenty-five years! 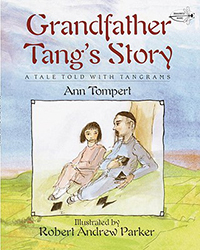 When Little Soo asks for a story, Grandfather Tang arranges the tangram pieces and two magic fox fairies spring to life. The foxes change shapes as quick as a wink, from rabbits to dogs to squirrels and geese. But their game turns dangerous when a hunter raises his bow. . .